It’s not often we get a chance to show off the Dueling skills from within Konami! For our Charity Event, we have several Konami bounty Duelists entered. If you can beat one, you get bonus Astral Packs! For this round, we’re showing off Senior Events Specialist Brandon Anderson, with his Thunder Dragon Deck. He’s up against Yusuf Salim, here from Texas with an Altergeist Deck. Salim won the dice roll and played first. He Normal Summoned Altergeist Marionetter, which put Altergeist Protocol face-down on the field. He played Pot of Desires to draw two new cards. “How sad would you be if I Ash this?” Anderson asked, “On a scale of one to ten.” “About an eight,” Salim said, looking . Anderson pulled a card from his hand, and… it was not Ash Blossom & Joyous Spring. “Just kidding,” Anderson smiled. Salim played Secret Village of the Spellcasters! He Set one more back row card. Anderson used Thunder Dragondark at the end of Salim’s turn. Anderson had a hand of two Thunder Dragondark, Chaos Dragon Levianeer, Black Luster Soldier – Envoy of the Beginning, and Ghost Reaper & Winter Cherries. he drew Thunder Dragonhawk. He used Dragonhawk to revive Dragondark, and Tributed Dragondark to play Thunder Dragon Colossus. He activated Dragondark’s effect to add Thunder Dragonroar to his hand. He then banished Colossus and Dragonroar to play Thunder Dragon Titan! He used Dragonroar to Special Summon Dragonhawk from the Deck. Thunder Dragon Titan attacked Altergeist Marionetter, and Salim used Altergeist Kunquery to negate the attack and negate Titan’s effects! At the End Phase, Dragonhawk returned to the hand. Salim flipped Personal Spoofing to shuffle Altergeist Silquitous into the Deck, adding Altergeist Multifaker to his hand. He Special Summoned Multifaker, which Special Summoned Silquitous from the Deck. 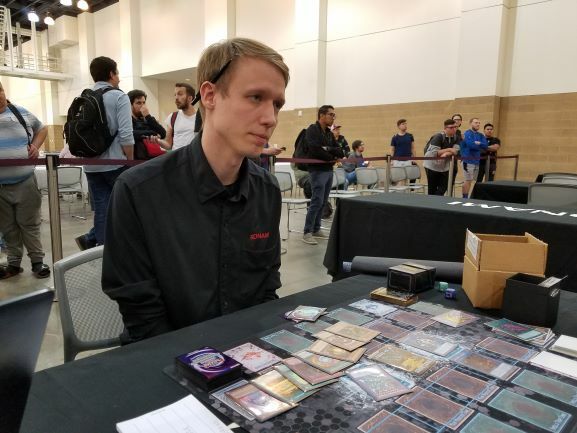 Silquitous bounced Multifaker back to his hand, and bounced away Thunder Dragon Titan! Salim used Silquitous and Kunquery to play Altergeist Hexstia! Marionetter and Hexstia attacked directly, leaving Anderson with 3300 Life Points. Salim Set two back row cards. Anderson drew Instant Fusion. He activated Dragonhawk’s effect, and Salim flipped Altergeist Protocol, sending Marionetter to the Graveyard to negate the activation of Dragonhawk. Anderson banished Dragondark and two Dragonhawks to Special Summon Chaos Dragon Levianeer! Dragonhawk’s effect gave Anderson a new hand of five cards. He drew two Dragonroar, Dragondark, and two Thunder Dragon Fusion. Then, the banished Dragondark added Thunder Dragonmatrix to his hand. Finally, Levianeer destroyed Personal Spoofing and Secret Village of the Spellcasters. Now free to play Spell Cards, Anderson activated Thunder Dragon Fusion! He shuffled Dragondark and two Dragonhawks into the Deck to play Thunder Dragon Titan! Salim flipped Mind Crush, declaring Thunder Dragonmatrix – he didn’t realize that Dragonmatrix was a Quick Effect! In response, Anderson activated Dragonmatrix to boost Titan, and Titan destroyed Salim’s Set Altergeist Manifestation! 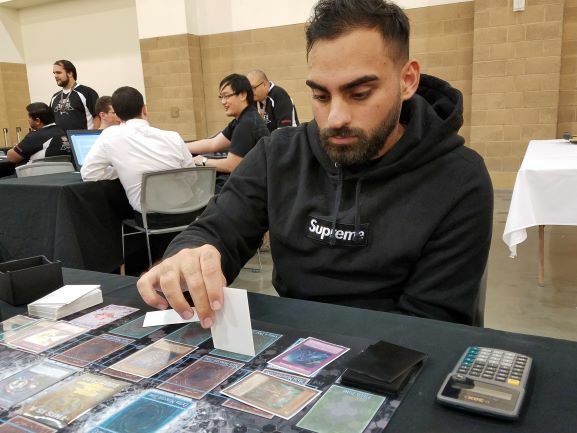 Mind Crush now resolved, and Anderson revealed his hand, with no copies of the declared Thunder Dragonmatrix – Salim was forced to discard his last card and conceded! Salim started with One for One, discarding Marionetter to bring Altergeist Meluseek to the field. He used it to play Linkuriboh, and Meluseek added Multifaker to his hand. He Set three back row cards, leaving just Multifaker in his hand. 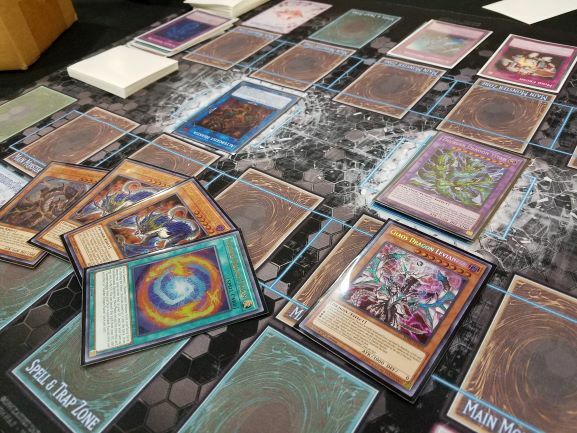 Anderson had a hand of Denko Sekka, Instant Fusion, Gold Sarcophagus, Monster Reborn, and Thunder Dragon Fusion, and drew Unending Nightmare. He Normal Summoned Denko Sekka, and lost it to Solemn Warning. He played Gold Sarcophagus, banishing Dragondark for two turns, which added Dragonroar to his hand. Instant Fusion let him Fusion Summon Kaminari Attack, and he banished Kaminari and Dragonroar to play Thunder Dragon Titan! He activated Dragonroar, and Salim flipped Altergeist Protocol. Dragonroar Special Summoned Dragonmatrix, and Salim Special Summoned Multifaker in Defense Position. Multifaker’s effect brought Silquitous to the field in Defense Position. Silquitous’s effect bounced Multifaker and Thunder Dragon Titan. Anderson Set Unending Nightmare. In the End Phase, Dragonmatrix bounced to his hand. Salim played Meluseek, and Anderson flipped Unending Nightmare, using its effect to destroy Altergeist Protocol. Salim Chained Personal Spoofing, shuffling Protocol back into the Deck to add Marionetter to his hand. Anderson used Unending Nightmare again, destroying Personal Spoofing. Salim attacked directly with Silquitous, Linkuriboh, and Meluseek. Meluseek’s effect sent Unending Nightmare to the Graveyard. Salim used his two Altergeists to Link Summon Altergeist Hexstia, and Meluseek added Kunquery to his hand. Anderson drew Dragondark. He activated its effect to add another Dragondark to his hand. Thunder Dragon Fusion came next, shuffling his banished Dragondark and two banished Dragonroars into the Deck to play a new Thunder Dragon Titan. It attacked Linkuriboh, and Salim Special Summoned Kunquery to negate the attack. Kunquery targeted Titan, Anderson Chained Dragonmatrix on Titan, then Chained Titan’s effect to destroy Kunquery first! Salim played Marionetter, which Set Altergeist Protocol on the field. Then, Marionetter used its effect targeting itself and Meluseek in the Graveyard. Anderson responded with Dragondark from his hand, then Titan as Chain Link 3! Titan destroyed Marionetter before it could resolve, and Dragondark added another copy to Anderson’s hand. Salim played Pot of Desires for two new cards, and passed the turn. Anderson drew Thunder Dragon. He activated it, using Titan to destroy Linkuriboh. Salim flipped Protocol, sending Hexstia for its cost. Anderson responded to that with Dragondark, then Titan again as Chain Link 5, this time targeting Protocol. The Chain resolved, with Protocol and Linkuriboh destroyed, and Anderson adding a Thunder Dragon and a Dragondark to his hand. Hexstia’s effect then added Meluseek to Salim’s hand. Salim then Special Summoned Multifaker, which Special Summoned Silquitous. The round timer ended here, with Salim leading by 2600 Life Points! Anderson could play Superdreadnought Rail Cannon Gustav Max, but that wouldn’t be enough damage! Salim had blocked him long enough with his Altergeists to survive and win this Duel. That meant the Match was a Draw! Technically, Salim was supposed to win to get the bonus Astral Packs. A Draw is like half a win, so Anderson gave him half the packs anyway. It’s all for a good cause, after all!